In the old days the idea of euthanasia was closely related to the sad reality of a broken leg. Many a movie had scenes where the hero must shoot his trusty steed because of such an injury. Fortunately, this is the past, and these days leg fractures are not only easily healed, but within about 12 months of the fracture many animals are able to get back into competition. 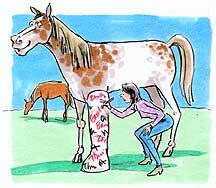 What makes fracture so challenging is the fact that a horse will put immediate weight on the affected limb. Humans have the ability to use crutches and wheel chairs to keep weight of a broken limb, thus furthering the healing process. Horses on the other hand do not have this luxury. Once surgery is completed, the animal will need to walk back to its stable. Fractures may happen to any animal, but they do seem to be especially prevalent in rodeo and cow horses. The treatment used generally entails the kinds of implements that are in use for humans, such as screws and also plates. Yet to help the animals recover quicker there are now available extensive support casts, quite often made from fiberglass, which take into account the need to put weight on the affected limb right away. Another danger of the past was the risk of infection. This was usually seen when the bone had punctured the skin, thus leaving the limb susceptible to the introduction of bacteria. While such harmful substances can still enter the horse, there are now useful antibiotics and means by which to administer them which help the treatment of broken limbs succeed. As a horse owner, there are a few things you will need to keep in mind if your animal will need to be treated for a fractured limb. First and foremost, carefully transport it to the veterinarian. You will need to ensure that the affected limb is supported properly to not make the problem any worse. If the bone has punctured the skin, you will need to cover it prior to transport. Once it has successfully arrived at the vet’s office, your animal will need to make it through the surgery and subsequent recovery. Keep a close eye on the affected to immediately report any signs of infection. Also keep a very watchful eye on the leg opposite the one affected by the fracture; at times it may try to overcompensate for the weight of the animal and thus the horse may go lame. While it is true that treating a fracture – as well as the subsequent aftercare and recovery related procedures - is costly, it is also true that this kind of procedure is generally covered by insurance. Thus, with a bit of clear thinking after the accident, a quick trip to the vet, as well as a close eye on the progress of the healing limb, you will have your horse back in training sooner than you might anticipate! Read the next horse health tips article on Horse Jogging & Proper Shoeing.